This title has free online support material available. An incredible wealth of scientific data on global warming has been collected in the last few decades. The history of the Earth's climate has been probed by drilling into polar ice sheets and sediment layers of the oceans' vast depths, and great advances have been made in computer modelling of our climate. 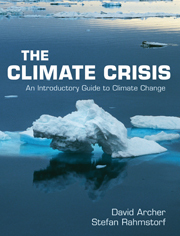 This book provides a concise and accessible overview of what we know about ongoing climate change and its impacts, and what we can do to confront the climate crisis. Using clear and simple graphics in full colour, it lucidly highlights information contained in the Intergovernmental Panel on Climate Change reports, and brings the subject completely up-to-date with current science and policy. The book makes essential scientific information on this critical topic accessible to a broad audience. Obtaining sound information is the first step in preventing a serious, long-lasting degradation of our planet's climate, helping to ensure our future survival. Preface; 1. Retrospective: what we knew and when we knew it; 2. Earth's energy budget; 3. Climate change so far; 4. Snow and ice; 5. How the oceans are changing; 6. The past is the key to the future; 7. What the future holds; 8. Impacts of climate change; 9. Avoiding climate change; 10. Climate policy; References; Index.